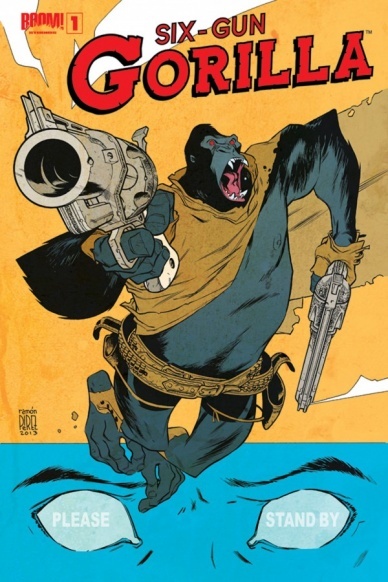 Well, I can’t say for sure exactly what I was expecting when I picked up Six Gun Gorilla #1, perhaps something between Yosemite Sam and Foghorn Leghorn, except, you know, a gorilla. What I can say though, I that the book definitely surprised me with what it ended up being. The best way that I can describe the title is a sort of steampunk civil war story, with the titular talking, gun-toting gorilla, space travel and a form of military-entertainment complex. Does that description make a hole lot of sense? No, I don’t imagine that it does, but don’t worry, I’m going to get a little more in depth with just exactly what we’re dealing with here. First of all, I need to point out that the titular Six Gun Gorilla is barely in this issue, filling perhaps a grand total of three pages. The main focus of this issue is a character only referred to as Blue-3425. Blue is one of a group of soldiers referred to as Holeheads. They are the literal expendables of this world, men and women with one reason or another to want to die, employed by Bluetech and implanted with retinl cameras to go to war in the colonies and die gloriously while provided point of view footage for the people back on earth. I admit, it’s certainly an interesting idea, one with a great amount of potential, just not really anywhere near what I was expecting. Is any of that a bad thing? No, it really isn’t. The truth of the matter is that the ideas present here are executed quite well. By no means is this a bad book, it’s just not a book that, knowing what I know now, I would run to pick up. I’ll give the book another go next month, an hopefully find a great deal more gun-toting gorilla. Who knows, this may yet turn into something amazing.